Now when you pay a visit to Disney World you won’t have to worry about where to put your wallet when you queue up for the theme park rides. This new device launched by Disney will enable you to leave your wallet at home. This device is not only really easy to use but also very convenient for the customer and for the retailer. 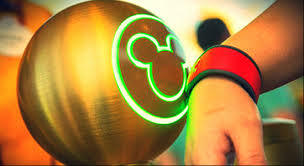 To avail of this device when going to Disney World all you have to do is register online for a bracelet and enter a pin code. This bracelet then provides you with a single device to simplify your vacation. It acts as your room key, payment device and your entry ticket. This is not all that this device can do. Disney went even further with the functionality of this device, for example, when you purchase a Memory Maker package this will allow you to see and download all the pictures that have been taken of you in the park by the Disney’s staff. Hotels could use it for room keys, paying for food and other amenities while staying in their hotel. A music festival or concert organiser could use it to sell the music of the performers, you will hold the wristband against a device and that would buy and download the music directly in to your phone, as well as being able to purchase food and drink at the event. In a night club you could be able to pay as easily as customers are paying in the Disney’s shops, by holding the wristband in front of the payment device. This device could also be useful for corporate events and seminars. Big benefits to the retailer will be improved profitability; reducing the amount of time to serve the customer and time on administration with cashless tills. The other advantage is that the customers will no longer look to their wallet to see how much they have left, and so will be more inclined to spend money because of the ease of payment. Moreover, this bracelet can be customised which allow the retailer increase brand awareness.